Egg pie. That’s what my about to be 4 year old called this quiche. He has become quite the sous chef in the past few weeks…always coming into the kitchen and helping me cook. I’ve started to let him help me crack the eggs (highly supervised still!) and taught him it’s better to crack on the counter than the edge of the bowl, and how to keep the yolk from running all over the counter. I feel more comfortable with him helping me with raw eggs when we are using Safest Choice pasteurized eggs, especially when he’s helping me with making cookies! He said, “Mom, I don’t think I like ‘egg pie. '” I responded with the typical you-won’t-know-til-you-try-it montage that every parent with a toddler or picky eater preaches on a daily basis. It was tough, but I resisted the second half of that “see, you never know what you might be missing out on” speech and instead let him keep enjoying his egg pie. 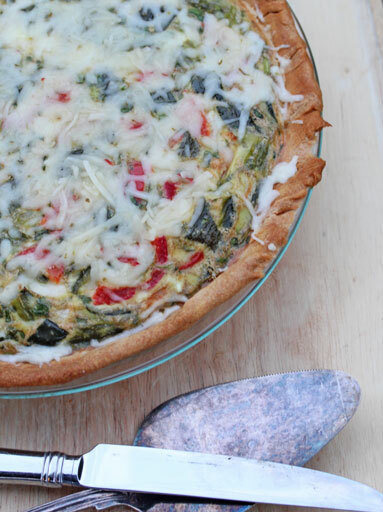 Love the flavors that filled this quiche, and I hope you will too! Preheat oven to 400. Place the 3 peppers on a baking sheet. Roast the peppers in the preheated oven for 20-25 minutes, or until skin begins to shrivel. Remove from the oven and let cool. Reduce the oven temperature to 350. Meanwhile, in a mixing bowl, whisk the eggs, milk, chopped onion and cilantro. Whisk in the cumin, garlic salt and pepper. Add the pie crust to a lightly greased 9″ pie plate. Once the peppers have cooled, cut the core and seeds out of the roasted peppers. Peel any skin off that will come off easily. Then chop the peppers into small pieces. Stir them into the egg mixture and then pour into the pie plate. Bake in the oven for 40-45 minutes, or until egg bounces back in the middle of the dish. Remove from the oven and sprinkle a thin layer of shredded cheese on top. The heat from the quiche will melt it quickly. Serve the Roasted Poblano Pepper Quiche with fresh fruit. *Disclosure: This post is part of a sponsored series with Safest Choice Eggs. This year I have been sharing recipes and tips as part of Safest Choice Eggs’ Darling Dozen. Recipe, opinions and silly kids are my own. Could you make this crustless? I think that it would be possible (and then a true contender for pantry meal status), although it reminds me that I got an easy pie crust recipe years ago through a bookclub. 2. In measuring cup, add COLD MILK to the VEGETABLE OIL and whisk together with a fork until emulsified. 3. Add liquid to the pie pan and mix with a fork until ingredients are totally blended. 4. Press dough against the sides of the pan, spreading the remainder evenly on the bottom. 5. Flute the crust around the rim of the pan. 6. Add filling and bake according to directions suggested by your pie recipe. For a PRE-BAKED crust, prick bottom of pan with a fork and bake at 425 degrees for approximately 15 minutes, checking often for brown-ness.